Dr. Frederick Navarro is the discoverer and developer of the Patterns of Adapting to Health (PATH) covered in his book, Pattern of Health. Based on his work with the PATH, Dr. Navarro developed PATH Analysis. Dr. Navarro is a health psychological researcher, trainer, and coach with a PhD in health psychology and MA in psychological research. He began his career as a healthcare marketing researcher studying healthcare consumer behavior. Following his career in healthcare marketing research his work focused on the modeling of adult adaptive responses to different health-related situations (e.g., health-related behavior), studying the organization of these adaptive responses in patterns within individuals and populations, and how these patterns shape health outcomes. How many times do you remember the ache of frustration because you started a diet that you couldn’t stick with? How often did you see friends getting fantastic results from the same exercise schedule that you found impossible to bend your life around? And think of that someone you know whose very life depends on a few simple changes that they just can’t seem to make. 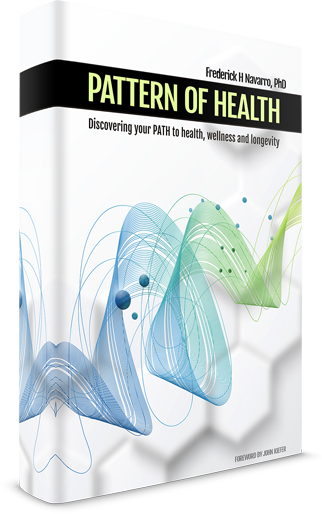 Pattern of Health is a groundbreaking look at these forces and reveals how health related behaviors are linked. Pattern of Health demonstrates that when it comes to exercise, diet, medical care, and overall health outcomes, we may not be as uniquely individual as we thought all along. Most people fall into one of nine patterns. These patterns pre-determine how they’ll feel about vigorous exercise, diet, medical help and other health-related behaviors. Are you more likely to develop heart disease or hypertension? Will you suffer back or joint pain? How predisposed toward mental illness are you? Let me show you your pattern and you’ll find your answer in your Pattern of Health.